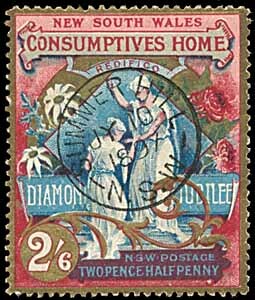 The 1897 Consumptives Home issue of New South Wales - 2½d (2/6) stamp. examples of cancellations on stamps off cover and a summary listing. "The motive of 'restoration' or 'rebuilding' is typified by two figures draped in white, the strong gently leading the weak, while she points to the motto "Redifico'. This vignette is placed in a diamond frame, above which are the words 'Consumptives Home' inscribed on a riband. A circle of gold forms the background, upon which the flannel flower and waratah are displayed. In the left lower corner is a medallion bearing the figures 2/6, while the base of the design is inscribed 'N.S.W. 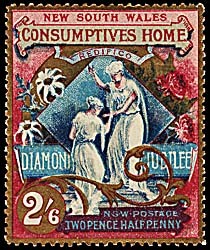 Postage, Twopence Halfpenny". This stamp is printed in gold, blue, rose and carmine." 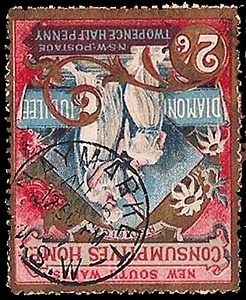 The postal denomination of 2½d covered the foreign letter rate. Both of the N.S.W. Charity stamps were designed by C. Taylor. 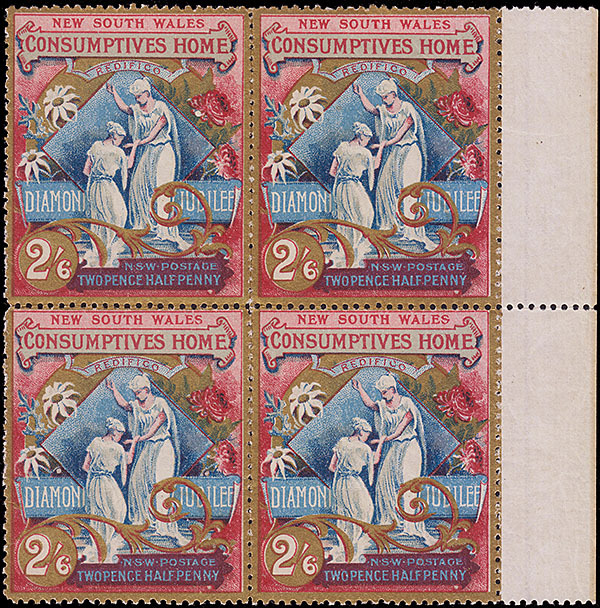 The 2½d (2/6) stamp was also printed by the Government Printing Office, Sydney, using chromolithography in sheets of 30 arranged in six rows of five. Separate 30-on plates were prepared for each of the four printing colours - gold, blue, rose and carmine. 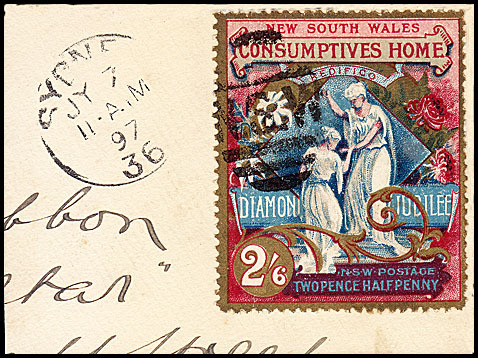 28 June 1897 - but valid for postage until 31 August. Crown and NSW (inverted and showing NSW from the front). When viewed by holding the stamp upright, the watermark is upside down. the used example has a reference of VicSc 17/49. 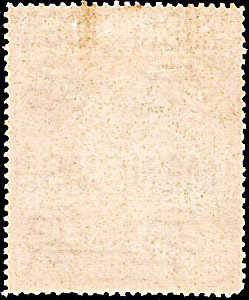 one mint block of six (3 rows and 2 columns) from the left of a sheet. There are reports that it has been separated into a block of four and a pair. (Harmers of Sydney Sale 269 Lot 421). The H.R. 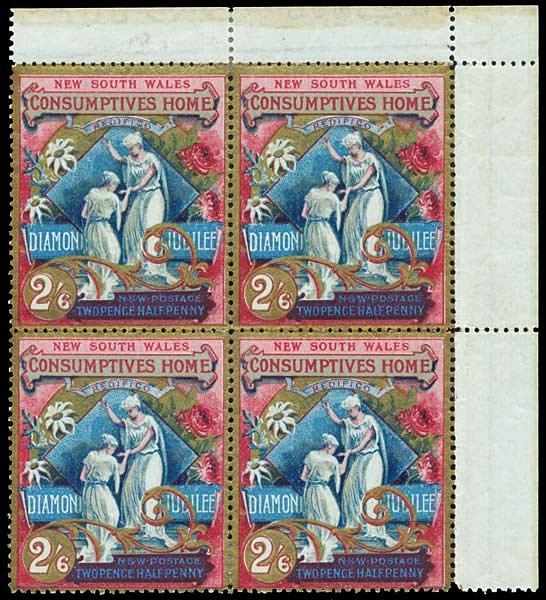 Harmer (Aust) Sale 29/30 of October 1949 listed two blocks of six. one used block of six (3 rows and 2 columns) from the base of a sheet. 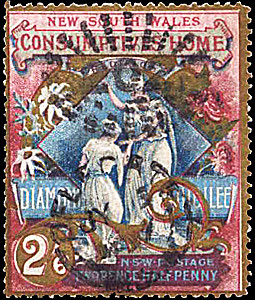 Has circular George Street West date stamp on each stamp of 31 August 1897 (Harmers of Sydney Sale 269 Lot 423). about nine blocks of four. Each has distinctive features as shown below. Selvedge at the right only. Showing watermark frame-line in selvedge. Status January 2002 Lot 1120. Top right corner bloc with complete selvedge. Has watermark frame-lines in both selvedges. Prestige Philately August 2012 Lot 262. Top and left Upper stamps MLH, lower stamps unmounted. Has a dot in the selvedge in the top right corner. Prestige Philately April 2009 Lot 353. Top and left MUH. Status October 2013 Lot 1640.
has gum run above top right stamp and a hinge. Millennium Rarieties October 2004 Lot 12.
spot under the 2nd N of PENNY in the top left stamp. Premier Rarities sale January 2003 Lot 221. No selvedge Some vertical separation, strengthened. Millennium February 2005 Lot 51.
between the upper pair. Ebay February 2012. Like the situation for the 1d (1/-) stamp, singles are plentiful and MH/unused examples are common. Singles and pairs can only be rated as scarce if they are in good MUH condition with reasonable gum. Unfortunately the majority of stamps off cover are unused (no gum) and/or are in poor condition with thins, creases and stained. A block of four with a Parkes cds of 2 December 1897, matching the 1d (1/-) block of four is known (Status Auctions July 2002 Lot 1248). 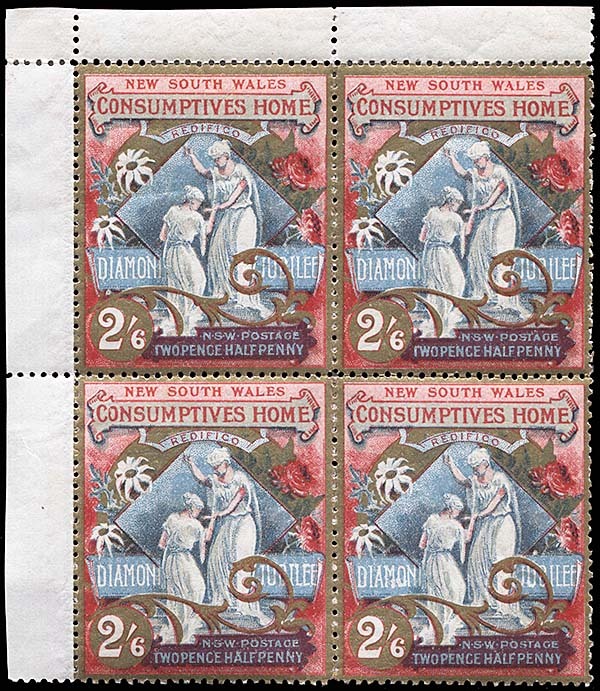 As listed below, there are at least than 21 good used examples of single 2½d (2/6) stamps - but there are probably less than 30 examples of good, collectable items. 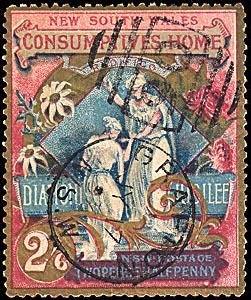 The earliest recorded date for a 2½d (2/6) stamp off cover is 22 June 1897. Most recorded dates are to December 1897 although, like with the 1d (1/-) stamp, some are known with date stamps a long time out of the validity of the stamp - for example 17 March 1909 at Sydney (Status Auctions December 2002 Lot 1005) and 27 September 1937 at Melbourne!! (Sandafayre October 2913 Lot 5341). There are a number of cancelled examples with only the barred ray cancellation but no date is included. These, together with partial or indistinct cancellations, have been ignored on account of a doubt over their validity. but 6 days before the issue of the 2½d. Delegate duplex 202 3 July 1897. Prestige January 2005 Lot 394. Sydney NSW duplex 7 July 1897. Status November 2013 Lot 1641. Summer Hill 10 July 1897. Prestige Philately April 2011 Lot 337. Grafton 90 duplex 17 July 1897. Richard Allen September 2013 Lot 58. Listing of known date stamps on 2½d (2/6) stamps. 22 June 1897 Milperinka. The top of the date stamp near sick person's head and it is rotated 10 degrees anti-clockwise. Provenance: Duncan Manins. 22 June 1897 Tenterfield Provenance: Duncan Manins (June 2014). 29 June 1897 Sydney Date stamp centered, rotated counter-clockwise about 50 degrees and struck at 1:00 pm. Ebay (techgifts) December 2017. 30 June 1897 Sydney 3 at 4:30 pm. Rotated slightly counter clockwise. N of NSW duplex extends to EE of JUBILEE. Ebay September 2018. 1 July 1897 Sydney 32 Date stamp cetered slightly left and rotated about 30 degrees. Time is 4 pm. Ebay May 2018. 3 July 1897 Delegate 202 rays. Prestige Philately January 2005 Lot 394. 3 July 1897 Goulburn Duplex 35 (Freeman type 5) struck sideways at 3:30 pm with date stamp at the base. Status September 2016 Lot 1650. 5 July 1897 Sydney (Registered) Date stamp rotated 90 degrees counterclockwise. Spink May 2018 Lot 62. 6 July 1897 North Sydney. On piece - nice item. Status February 2012 Lot 1499. 6 July 1897 Park Street 924 duplex Placed vertically with numeral at top. Marginal seldevge at top. Ebay March 2015. 6 July 1897 Summer Hill In the center and rotated clockwise about 100 degrees. Top just touches T in ...PTIVES. Ebay March 2017. 6 July 1897 Broken Hill In the center and rotated clockwise about 140 degrees. Top just touches top of VES. Ebay March 2017. 6 July 1897 Ashfield 193 BN duplex BN just visible on top right side.. Techgifts (Ebay) March 2018. 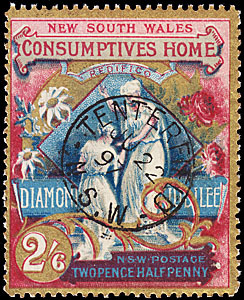 7 July 1897 Sydney 36 NSW duplex Duplex on LHS of stamp. Status November 2013 Lot 1641. 10 July 1897 Summer Hill. Prestige Philately April 2011 Lot 394. 17 July 1897 Grafton 90 duplex. Date stamp is diagonal with '90' duplex in top right corner. DnJays September 2013. 19 July 1897 Sydney Matthew Bennett February 2003 Lot 560. 22 July 1897 Murwillumbah. Status December 2002 Lot 1005. 23 July 1897 Parramatta Status July 2003 Lot 1246. 24 July 1897 Kempsey (West) Prestige Philately March 2005 Lot 257. 29 July 1897 King Street Date stamp centered but rotated 130 degrees clockwise. Ebay August 2018. 2 August 1897 Warialda Velvet Collectables June 2014 Lot 1668. 5 August 1897 Haymarket 1750 PM. Richard Allen, September 2013. 6 August 1897 Rockdale duplex 1127. Status May 2002 Lot 1174. 31 August 1897 George Street West. Harmers of Sydney Sale 269 Lot 423. 2 December 1897 Parkes. Block of four. Status July 2002 Lot 1248. 2 December 1897 Parkes. Single with top cuting H of SOUTH and rotated 10 degrees clockwise. Status July 2002 Lot 1249. 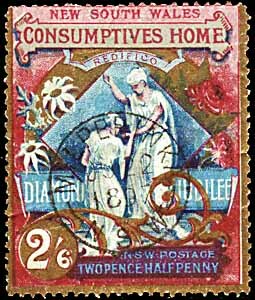 16 August 1901 Sydney 26 NSW duplex Single on piece. Rough perfs at the base. S of duplex just visible at right. Ebay (techgifts) March 2018. 27 September 1937 Melbourne. Sandafayre September 2013 Lot 5341.